yumm!!! Your food looks so good!!! I served a mission in japan and my girls love japanese food!!! I am so excited for new recipies!!! Your recipe looks really easy, I feel like I can make it too! However, I don't have any of the sauces, is there any way for me to make it myself? Also, is the Grated Yamaimo needed as an ingredient? I noticed another recipe that has that in it. It's a type of white mountain yam. Thanks and I'm glad I came upon your site. Stir well to dissolve sugar. It depends what kind of barbecue sauce and ketchup you use, so adjust the amounts to suit your taste. 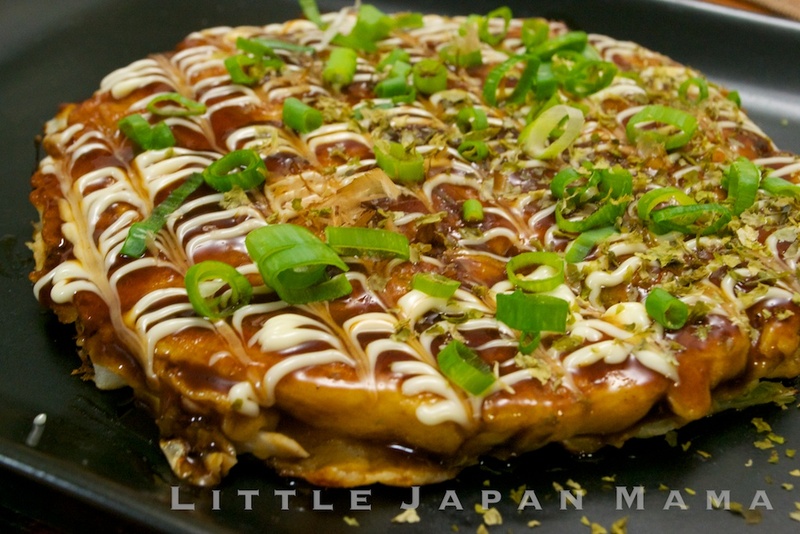 Grated Yamaimo enhances the texture of the okonomiyaki and makes it...(how do you describe it?) more moist, even when fully cooked. 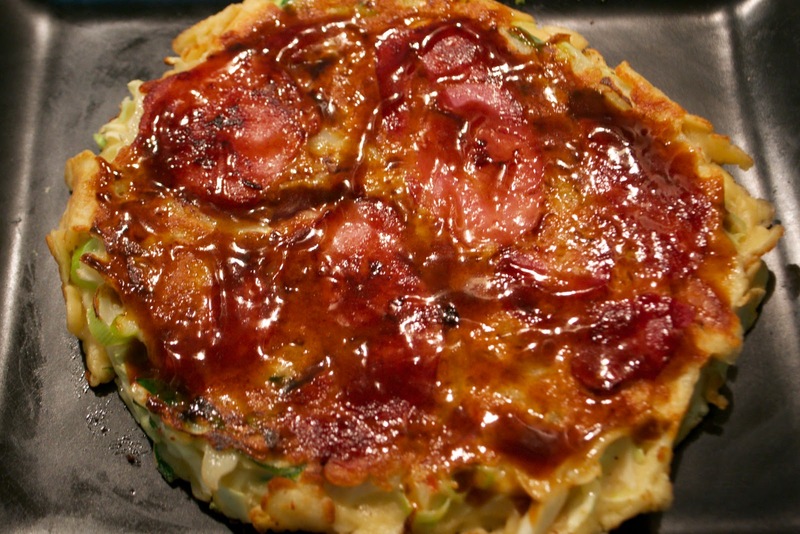 Actually not all Japanese use it, even in Japan, so you can certainly make Okonomiyaki without it! I am going to make this tonight. 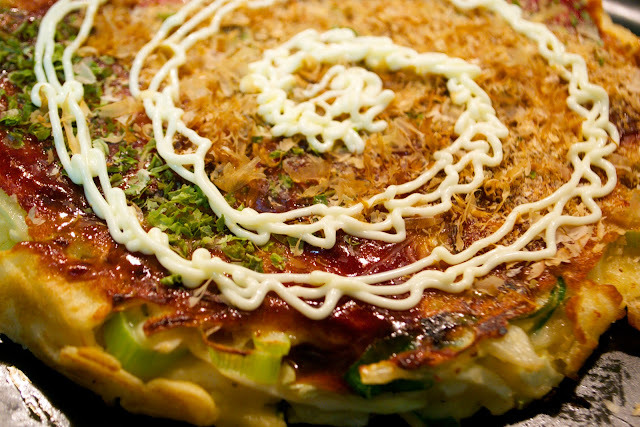 We often eat at a little Japanese cafe around the corner and they make the best Okonomiyaki I've eaten. So here goes! Thank for the recipe! I have a quick question. Where would you get mochi and how would it be packaged/what section would it be? Hi, Mochi もち looks like bars of soap! Hard rectangular blocks about 6x4x2cm. Usually you will see a bag of 10 or 20, in clear plastic bag-type packaging. It will be in the dry food Japanese section. Sometimes the individual blocks are also individually sealed, this is better as you can store the whole package in the refrigerator for months. Once the mochi blocks are exposed to air, they either go mouldy or dry and crack within a couple of weeks. 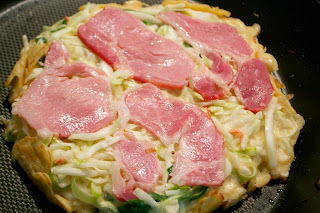 When using Mochi in Okonomiyaki, slice the blocks as thin as you can, 2-3 mm thick, and place them in a layer inside the okonomiyaki. They melt with the heat and make a mozzarella cheese-textured surprise in your okonomiyaki. Mochi pairs well with melted cheese, too. i am a filipina but i serve japanese families in singapore and eversince i love to cook andjapanese dishes! lucky to found this site,,,,,,,arigato! THanks for ur sharing !! very good and useful !! Thanks for this great recipe! I've made it a few times and the family love it. One question I have though is which type of cabbage is best to use? 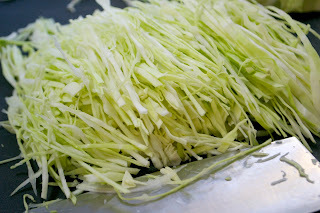 I've been using Chinese cabbage, which is quite thin and light, but I wondered what type is used traditionally? Hi Gavin! Okonomiyaki is traditionally made with regular green cabbage! I've tried it with Chinese cabbage too, an interesting variation :) but it's normally made with plain jane regular old green cabbage. How ugly, it looks nothing like the photo, how did you do that? This is the best okonomiyaki recipe I've used, thanks! 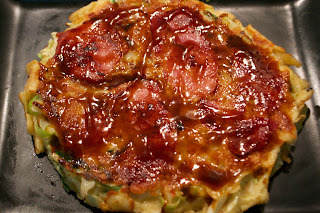 I used gluten free self raising flour and mixed in tofu and eschallots with cabbage in the batter, to make it like we have it in the little shop outside of Kinkakuji in Kyoto, then cooked it with bacon. I then threw on some rice bubbles because it is too fussy making the tempura bits. Absolutely perfect - light and fluffy with great flavour. Cheers! My partner and his very fussy daughter absolutely LOVE this recipe. In fact, I'm making it tonight. Thanks for sharing! These recipes are so colorful and lovely. is the bacon already cooked or do you put the bacon on raw? 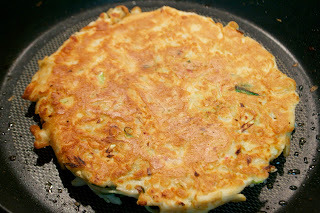 Managed to make okonomiyaki successfully with your fail proof recipe TQ!